I’ve never seen anything quite like it before: so many young faces – mostly teenagers but younger children, too – acting with purpose and political vision. This display of determination – over 20,000 overflowed from Invalidenpark in Berlin as part of the worldwide school strike for climate justice – turned our cultural order on its head: children were acting more maturely, more responsibly than their parents, even scolding their elders for their self-centered, reckless behavior. The kids loudly called out their parents’ (and grandparents’) generations, but they went further than that, too. 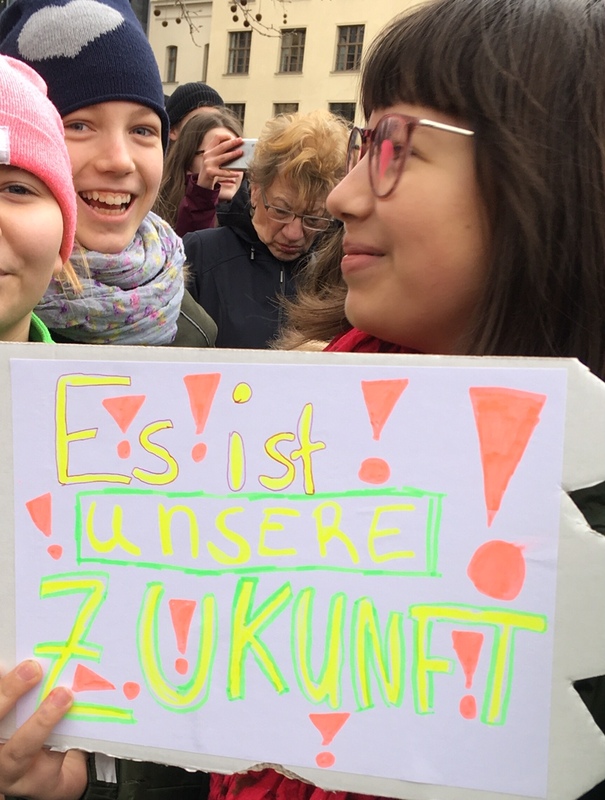 Kids walked out of their classrooms in 222 cities in Germany, and 2.000 cities and towns in 120 countries worldwide, breaking the law to protest climate change. The demos of March 15, 2019, may well prove a seminal moment in the history of the fight against global warming: the start of an international mass movement of young people that relies on civil disobedience. In contrast to some of the media reports, there was nothing naïve or amateurish about it. The political savvy, energy, and creativity on display showed why these young citizens will be taken seriously and why March 15 wasn’t a one-off event but rather the beginning of something with staying power. Take, for example, the site of the Berlin branch’s demo: downtown Berlin next to the Natural History Museum, where speakers and musicians underscored in every speech, song, and chant that the future of the planet is at stake. And take the astounding scope and organization: the coordination of well over a thousand such demos across the globe. The Berlin leg, which police and the organizers expected to attract just 5,000 activists, brought out five times that number – and oodles of media. The youngsters know exactly how to use social media for maximum impact, and how to get coverage that landed them on the front pages of newspapers and on the evening news just everywhere in the world. But the Berlin demo, and those that I saw on television and the Internet, weren’t just bitter tirades against parents. The kids were directing much of their frustration and emotion toward politicians who have the power to take serious climate action, but haven’t done so. The speakers on the podium talked about the Paris treaty, the promise of renewable energy, the footprint of our transportation and agriculture sectors, and individual responsibility. Greta Thunberg, the 16-year-old Swedish student who triggered the movement, did so by camping out on the steps of Sweden’s parliament to demand that her country reduce carbon emissions. Then she was alone. That was two short months ago. The hail of critique that has rained down on the kids for skipping school truly misses the point. Had the young people staged the protests only during their free time, they wouldn’t have had nearly the same impact – or message. By being truant, they broke the law, underscoring how important their cause is and, implicitly, that they’ll break the law in the future too, if they’re not taken seriously. And as for naivety, this barb was dispelled by the new Scientists for the Future group, namely 23,000 German scientists and other experts who supported the strike. A handful of them were at the demo, and from the podium they told the students that they are right. They get the point. Countries like Germany, they said, were going in the right direction but not nearly fast enough. It has to happen five times so fast, said renewable energy expert Volker Quashning of Berlin’s Technical University. Keep it up, kids, they told them, science is on your side. Indeed, the kids get it, namely the existential threat of global warning. And that they are the last generation that will have the opportunity to do something about it. German Chancellor Angela Merkel was one of the few world leaders that dared to praised them (once again in the face of her own conservative party, most of which shook their fingers at the naughty truants); and she seems intent on doing more for the climate in her final years in office. The UN secretary general, António Guterres, also commended them, promising he’ll double his efforts to bring leaders together in September for a climate action summit in order to limit global warming to 1.5C. This, though, is not nearly enough for Greta Thunberg and her peers who announced themselves as a critical new part of the global climate protection movement. They may not be old enough to vote, but they are obviously capable of serious civic action, this much they proved on Friday beyond a doubt. But skipping school alone will not further their aims. They have to take their cause to the offices of the politicians, business and industry leaders, and, of course, their teachers and principals too. Civil disobedience is now integral to their movement and they have to find new ways to wield it. Occupying offices and buildings, the way the Central America movement did in the US in the 1980s, is one option. But these tuned-in youngsters will surely come up with better ideas. They’ve already proven they’re capable of that. Looking at the protests on the narrow test of educational costs and benefits, it is most unlikely that the kids leant less from their day of protest than they would have absorbed in school. The best learning is practice: and the protesters experienced working with the media and organizing complicated events to a timetable. Most of them had to use a foreign language, English, essential to get the message heard. They spent the day thinking about a hugely complicated and multi-faceted set of problems. They grew up by more than a typical day. Congratulations!